Chris Claremont's run on Uncanny X-men is one of the most praised and loved comic runs of all time. In fact, Chris Claremont's X-men books are the only X-men books I have ever consistently read and enjoyed. Perhaps his best known X-men story is "The Dark Phoenix Saga". This 9 issue epic chronicles Jean Grey's eventual descent into villainy, as the dark force within her transforms her into the Dark Phoenix. Joining Chris Claremont is artist John Bryne, who brings a dynamic and vibrant look to the book without sacrificing human emotion. The story begins when the X-men are kidnapped by the Hellfire club (making their first appearance here) and, to their surprise, betrayed by Jean Grey. Jean is under the influence of a mind controlling mutant known as Mastermind, who convinces her she is living in the 18th century. It may sound strange and silly, but it actually works to such a degree that her "flashbacks" into the 18th century are often somewhat frightening and sinister. What makes them so effectively creepy is the fact that each time Jean slips into the past, she is suddenly put into a kind of fugue, wherein she believes that she is in love with a "Sir Jason Wyngarde" and apparently a queen of the shadowy and menacing Hellfire Club. The visions of the past are made more believable by the fact that Jean herself is actually scared of what's happening (she doesn't know why she is suddenly being whisked away 200 years to the past) and at first tries to fight the urges she has in them, but eventually gives in the temptations of the visions. Jason Wyngarde himself (actually Mastermind in disguise) is extremely foreboding and mysterious in the first couple parts of the saga. At first, readers don't know who Wyngarde is or why he is doing this to Jean, making him all the more frightening. After the X-men come into conflict with some lackeys of the Hellfire club, including Emma Frost in her first appearance, they decide to take the fight to the Hellfire Club. They infiltrate the Club's party, only to realize too late that it is trap and they are captured by the Hellfire Club's inner circle, a small group of elite and powerful mutants that swiftly take down the X-men. The inner circle is an interesting group of villains that work very well as a group. Each has a specific power set that work differently in taking down a member of the X-men; one member, for example, can become stronger after being punched or hit with kinetic energy, he is put against Colossus. The circle is also interesting in that we get to see the circle bicker with each other, one member even plots to bring down the current leader and take over the club for himself. These various aspects serve to make the club very interesting and entertaining to read. This saga contains the classic "Wolverine: Alone" issue in which the Hellfire Club defeats every member of the X-men and Wolverine must try to take down the entire club and rescue his friends on his own. Note that this issue came out before the current over saturation of Wolverine that currently exists. This issue was made before Wolverine was established as a major badass, and it is a joy to see Wolverine tear through Hellfire guards before he was the invincible and overused character that he is today. The panel of Wolverine saying "Now it’s my turn!" is easily one of my favorite panels in all of comics and still gives me goosebumps every time I read it. Of course the X-men do manage to take down the Hellfire Club and free Jean Grey from Mastermind's spell, but this is just build up to what the story is really about. They free Jean Grey, but Mastermind unintentionally loosed the Dark Phoenix. Jean finally succumbs to the power of the Phoenix and, in an emotional craze, sets out to destroy not only the X-men, but much, much more. Dark Phoenix is quite possibly the most powerful and sinister villain that the X-men have ever faced, but what makes her such a great villain is how tragic a character she is. Jean Grey tries doesn't want to hurt her friends, but she knows that there is nothing she can do to stop the Phoenix from destroying them. Even while Phoenix fights against the X-men, threatening to kill them all, it is evident that she is conflicted and fighting her own emotions. One scene that always stood out to me is when Jean Grey visits her parents and sister. It is clear that Jean loves her parents and doesn't want to hurt them, but she can't help but see that deep down they fear her, and so she angrily confirms their fears by threatening to obliterate them with her power. The Phoenix is shown as being a source of ultimate and divine power, and power corrupts, thus Jean Grey is corrupted. The X-men's own conflicted feelings towards Jean(destroy or save her? )make them just as well characterized and just as interesting as all of the other characters in the book. Their battles with Phoenix are fantastic even though she vastly overpowers them, and the physic duel between Professor Xavier and Jean Grey is nothing short of epic. All of this leads into the tragic and awesome final showdown between the X-men and the Imperial Guard on the dark side of the moon. The build-up to this battle is done wonderfully, with each member of the X-men(some not even wanting to battle)preparing in their own unique way for what will probably be the most important battle of their lives. The battle itself is fantastic as well. Each X-man puts up a tremendous fight, but the X-men are ultimately doomed to a battle they can't win; exemplifying perfectly the underdog nature that has always been inherent of the characters. The ending of this book should come as a surprise to no one, but I still won't spoil it just in case you haven't read it and have no prior knowledge of X-men continuity. The story, or saga, actually has three main parts; the first in which the X-men rescue Kitty Pryde and some of their own from Emma Frost after they are kidnapped, the second in which the X-men battle the inner circle of the Hellfire Club, and the third in which the X-men battle Jean Grey herself, now Dark Phoenix. Each part is fantastic, consisting of thrilling action, character progression, intriguing plot points, and deep themes. Even the Watcher, who I usually dislike, is used well here, and his final monologue is a perfect way to end the saga. 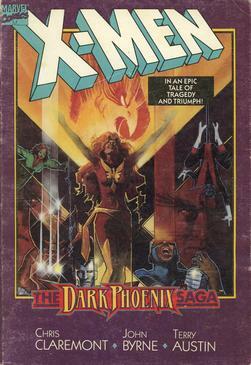 Overall The Dark Phoenix Saga is one Classic Comic that is definitely worth your time and cash. A must read for any X-men fan, Marvel fan, or all around comic fan.